Considered one of the greatest Azerbaijani composers, his music legacy has been sung and performed all around the world. The unforgettable pallet and richness of Garayev’s music touches a wide spectrum of human emotions. The legendary composer inherited his love of music from his parents. His father Abulfaz Garayev was a famous pediatrician, who enjoyed Azerbaijani folk music. Garayev's mother, Sona Khanim, was among the first graduates of the Music School, the Baku branch of the Russian Music Society. Between 1933-1938, Gara Garayev studied composition and folk music at the Azerbaijan State Conservatory. In 1938, he continued his education at the Moscow Conservatory, named after P. I. Tchaikovsky, where he initially studied composition with A. Alexandrov and then later in 1943 with legendary Dmitri Shostakovich (1906-1975). The creative heritage of Garayev covers almost all genres of musical art. Garayev wrote nearly 110 musical pieces, including ballets, operas, symphonic and chamber pieces, solos for piano, cantatas, songs and marches. He brilliantly juxtaposed features of Mugham with jazz, blues, African music, European counterpoint styles, and developments related to the 20th century Western music such as the 12-tone technique. In 1938, he composed his first musical piece, a cantata "The Song of the Heart" to the poem by Rasul Rza. It was performed in Moscow's Bolshoi Theater in the same year. He was only 20 years old at the time. The composer returned to Baku in 1941. He began teaching students at Azerbaijan State Philharmonic Society. In 1945, both he and Jovdat Hajiyev wrote the "Motherland" opera, for which they were awarded a prestigious Stalin Prize. A number of works of the late 1940s - early 1950s are influenced by the outstanding Azerbaijani poet Nizami - the symphonic poem “Leyli and Mejnun”, the symphonic suite "Seven Beauties", and finally the ballet on the same name, which became the pinnacle of the composer’s work. He can be justly considered one of the most powerful figures in the history of Azerbaijani music. In 2018, President Ilham Aliyev signed an order on October 17 to mark the 100th jubilee of the legendary Azerbaijani composer. A House-Museum of the legendary Azerbaijani composer Gara Garayev opened in Baku last year. The museum's collection includes personal belongings, posters, programs, photographs, books and other exhibits dedicated or belonging to Gara Garayev. February 4 is a memorial day of the outstanding composer. 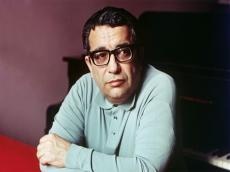 The memory of the legendary composer will be commemorated in Baku. A photo exhibition dedicated to composer will open at his House-Museum, Azertag reported. The event is organized by the State Museum of Azerbaijan Musical Culture. The concert will be also held as part of the event.